It's that time of the year. The pencil bin is almost empty. The markers are about dried out. You are still trying to figure out what that stain is in the middle of your classroom is. But who cares?!?! It's almost time to pack it all up and start thinking about next year's class. I've joined up with 20 other bloggers to offer you some of our best end of the year advice and give you an opportunity to get hooked up with some great stuff!! Crayon Check: In this stations, students go through my crayons. They put in a bin any broken crayons and neatly arrange the colors into their correct container. Marker check: Students check to make sure my markers are working. Again, they organize the colors into their correct container. Colored Pencil Check: Students sharpen and organize the pencils into their correct container. White Board Clean-Up: These students go through and completely clean off all my individual white boards. They also check the white board markers to make sure they are still working. Library Clean-Up: My librarians go through and clean up the library and put paper over my bookshelves. Game Checkers: These students go through my games and make sure all the pieces are intact and still there. Desk Cleaners: Despite having students wipe down their own desk, I still have a few who do a very thorough job to do it again. In addition to these stations, I always have a puzzle station open for those who just don't want to do anything else. Very seldom is it used but I want them to feel like they can take a break from all the manual labor. Thanks for joining our end of the school year blog hop today. We had a great turn out of hoppers. The prize pack part of the hop is now closed. 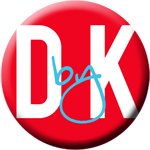 Stay tuned for blog excitement in mid July. Please keep hopping along to read our tried, tested and true survival tips. 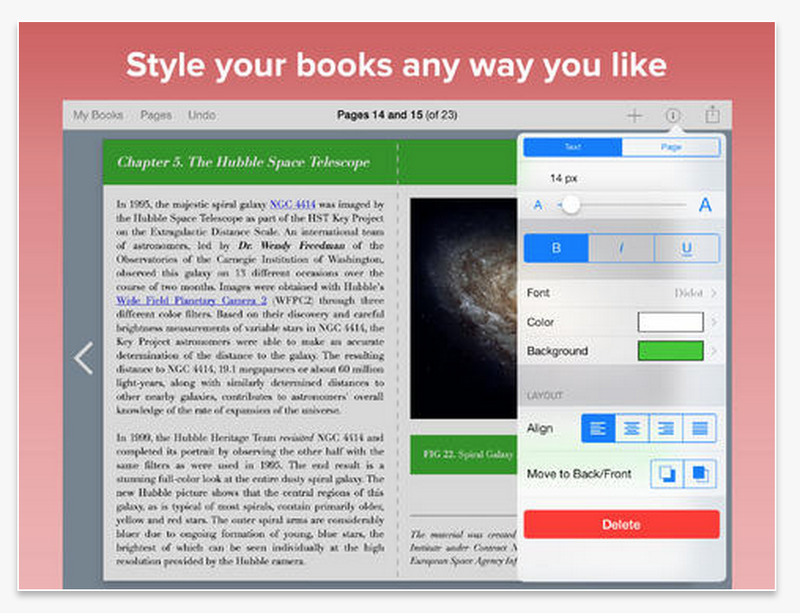 Book Creator - An app for the writing classroom! Do you write whole class stories with your students? Do your students write their own stories or write papers? I'm sure the answer to at least one of these questions is YES! 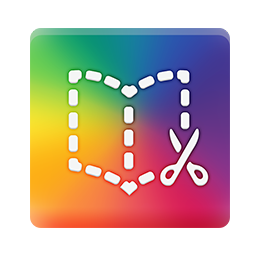 If so and you have access to either iPads or tables with Android, I highly recommend you check out the app called Book Creator. 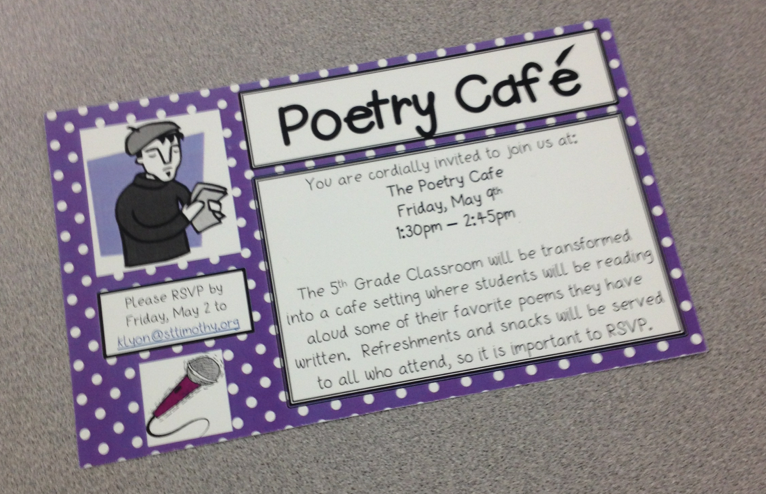 In my last post, I spoke about the Poetry Cafe I did with my students and mentioned how I had them use Book Creator to create their final poetry books. Some of you emailed me with questions regarding this app, so I thought I'd be a little more detailed on how it works. First, it's important to note that Book Creator has two versions - the Free one and the paid one. The free version limits you to being able to create only one book. Which is perfect to allow you to try it out first and see if you like it. I like how the free version just limits you that way and not on using all of the features that are available. The paid version is only $4.99 and if you get the education discount, you can get 50% off 20 or more licenses making it well worth it! quickly become authors. Once you open that app, you choose to create a new book. You get the choices of choosing your book shape from portrait, square, and landscape. I found that when printing the book, that using portrait was the best choice. But if you aren't printing and just using them as e-books, any shape would work. You have the ability to add photos, text, writing, and sound. I was really excited about the sound feature! You can't currently do a highlighted with read along but that wasn't too big of a deal for me. I can see how in the younger grades that would be very useful though. Hopefully it's something the creators of the app are looking into. You can also adjust the background color of the pages. One feature that my students particularly liked was being able to move the pages after you created them. This allowed my students to work on their poetry in any order and then move them to the appropriate location when done. 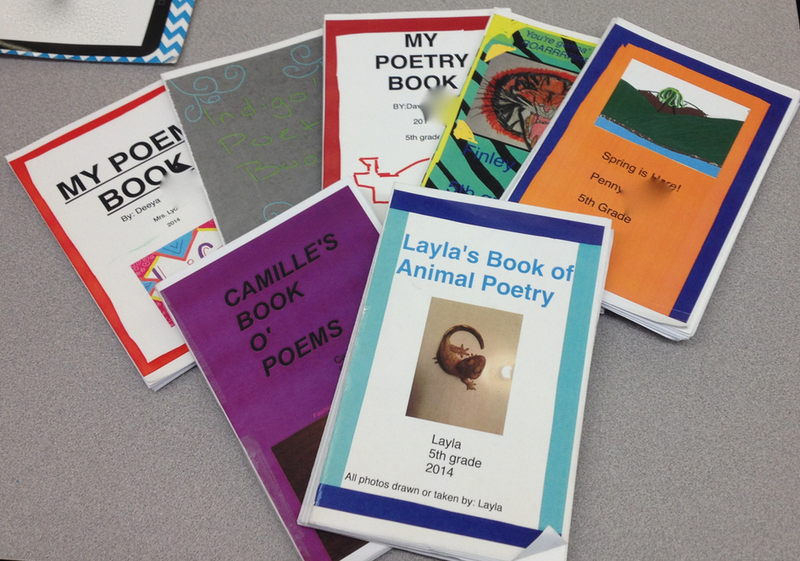 The best part was when my students were all done with their books, I was easily able to have them send them to me and COMBINE them into one large 5th grade poetry book. At first I didn't really think about the possibilities of this until I came across this teacher (it's actually posted on the app creators webpage) idea on creating a global book where people all over the world create a page and you combine them all together. How neat would that be!?! I started to think about how I could have my students and their pen pals create books together and so much more. 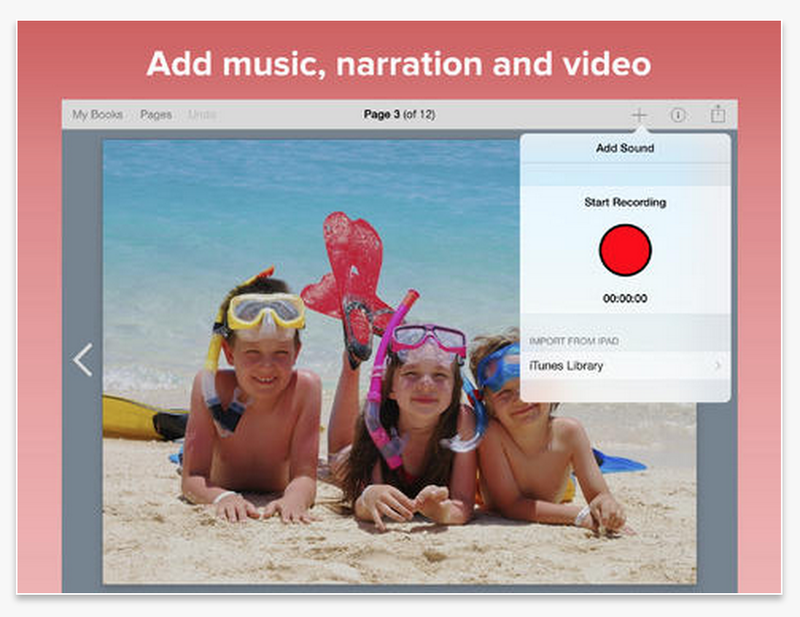 Next year.... How would you use Book Creator in your classroom? Can I be honest with you all? I've been teaching for the past nine years and every year I would quickly introduce poetry to my students and move on....I did just the bare minimum. I was never comfortable with it and quite honestly found that my students didn't get excited about it. However, I know that my enthusiasm (or lack of) can bring on that of my students. So this year I made a point of doing a full unit on poetry and mustering up every bit of encouragement and excitement that I could. It began simply enough with me creating a UBD on the book Tuck Everlasting. As I continued to expand this unit, I found that it led itself perfectly to poetry. So I headed online to find something this would help me link up this awesome book to a poetry project of sorts. I ended up on TpT and came across Mrs. Renz's independent poetry unit. The best part about it? It came with everything I would need (and so much more!) and there were parts that were editable! Say no more - I snapped it up and never looked back. Between using Mrs. Renz's Unit and my very own literary device posters, I was able to have students write their own poems. The goal was to write a minimum of three poems per type. The first poem was always the intro one we did in class and I would pick the theme. The second poem the students were required to write for each type was a theme of their choice, and the final third poem had to be a theme that we identified when reading Tuck Everlasting. Students wrote their poems and then using our iPads set to work to create the final draft. Using an app called Book Creator, my students created their entire poetry book which they later ended up sharing the ebook with me so I could print a final copy for them. Book Creator (there is a free version but I upgraded my students to the paid one) allows the user to share their books in e-form. This was perfect, as my kids could email it off to family members near and far. The whole time they were working on their poetry book, they were also reading and reflecting on poems of published poets. Simply put - they loved it! I heard time and time again how much they enjoyed the project! 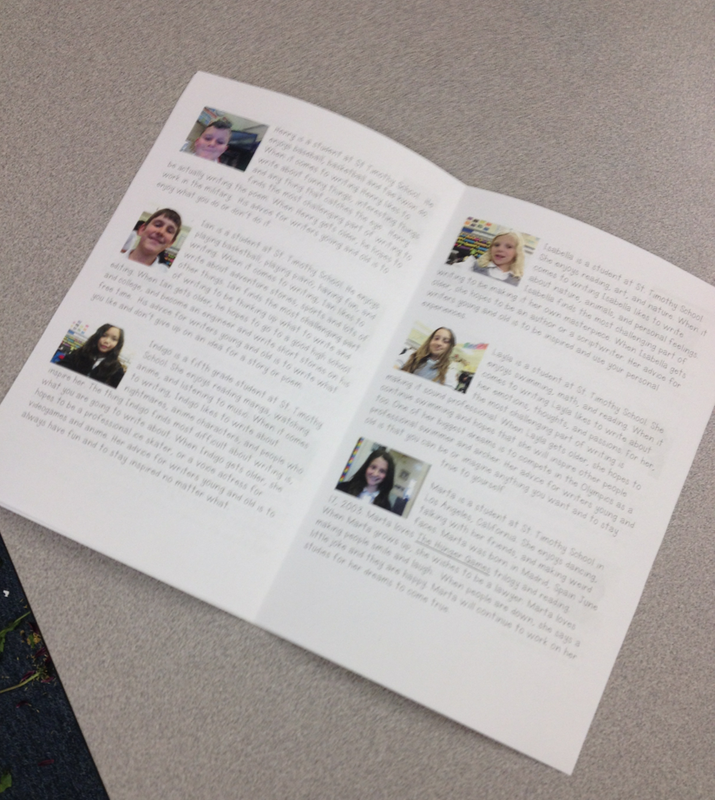 program with author bios (each student wrote a quick author bio which I put in the program with their picture. Finally the day of the even was upon us. I arranged it so my students (who usually have to wear uniforms) could show up dressed in what we called Poet Garb which consisted of all black clothing. They loved it! Some even came with artist hats (including myself). 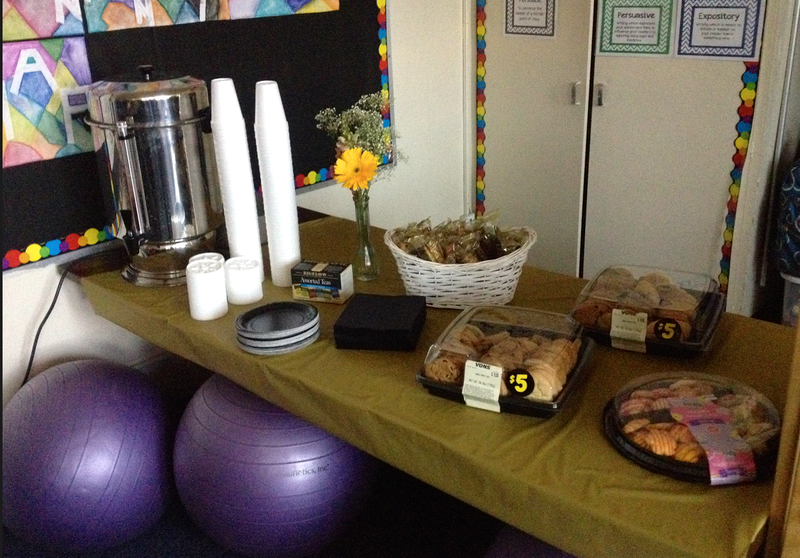 The students went to lunch and while they were gone I set to transforming our classroom into a cafe. 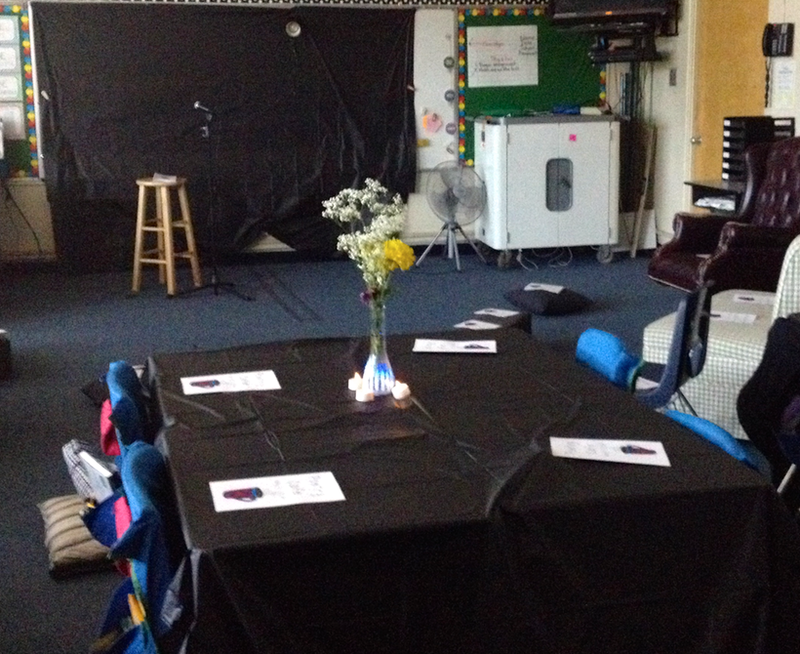 I put the black tablecloths against my whiteboard and hung a spotlight from the top so the students on "stage" would be lit up. I had the stool in the front along with a the fake mic and stand. (In the future, I would take the time to figure out how to have some sort of real sound system for those soft spoken students.) 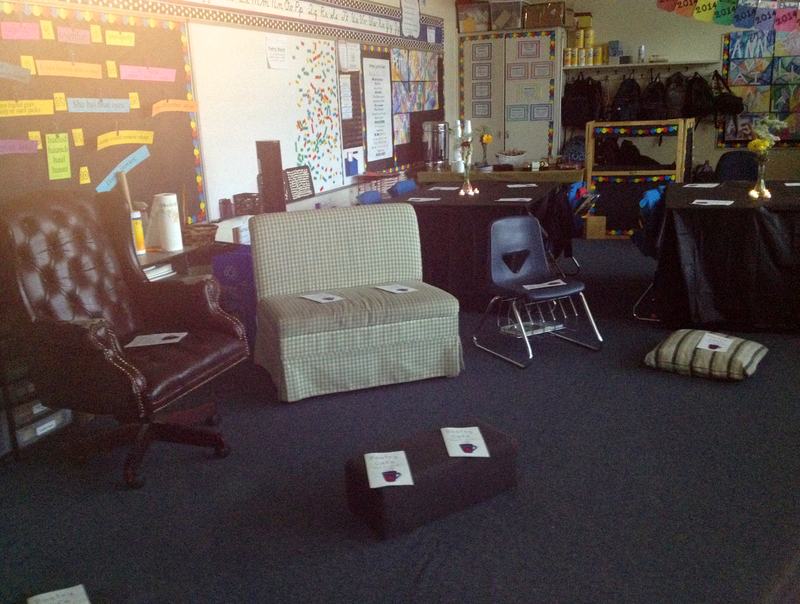 I rearranged our classroom so I had a large open space in the front for the students to sit, and put our pillows on the ground. 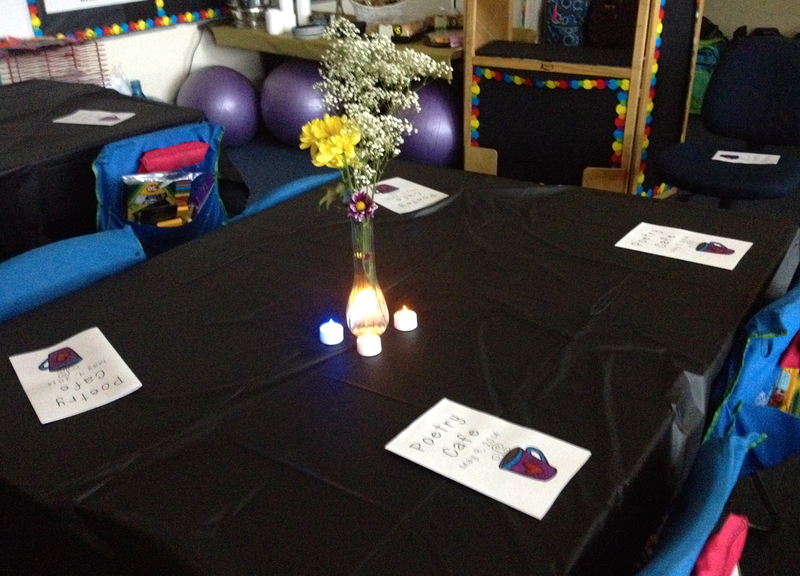 The students' desks were covered with a table cloth and I had a vase of flowers and flameless votives around them. And our back table had our hot beverages with cookies and snacks. I left the lights off and only allowed whatever light that came in from the windows and my spotlight be the only sources of light to give it a dark cafe stage feel. 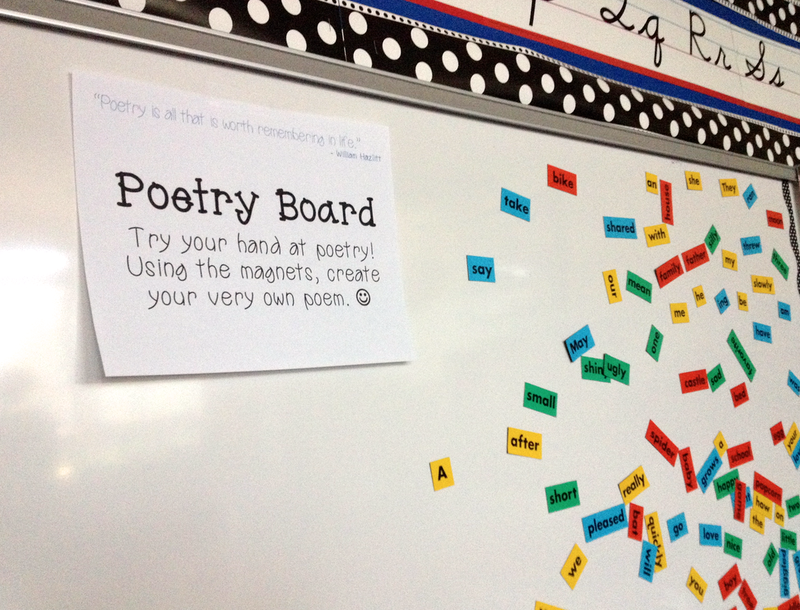 On my other whiteboard, I had put magnetic words with the poster below to encourage parents to write some poems. It looked awesome! The parents started to arrive and our show began. Here is small clip of one of my students reciting her awesome poem. Overall the event was a success! Both parents, students and PRINCIPAL loved it. I received so many compliments (especially when they learned it was the first time I had ever done a poet unit of that size and this event. 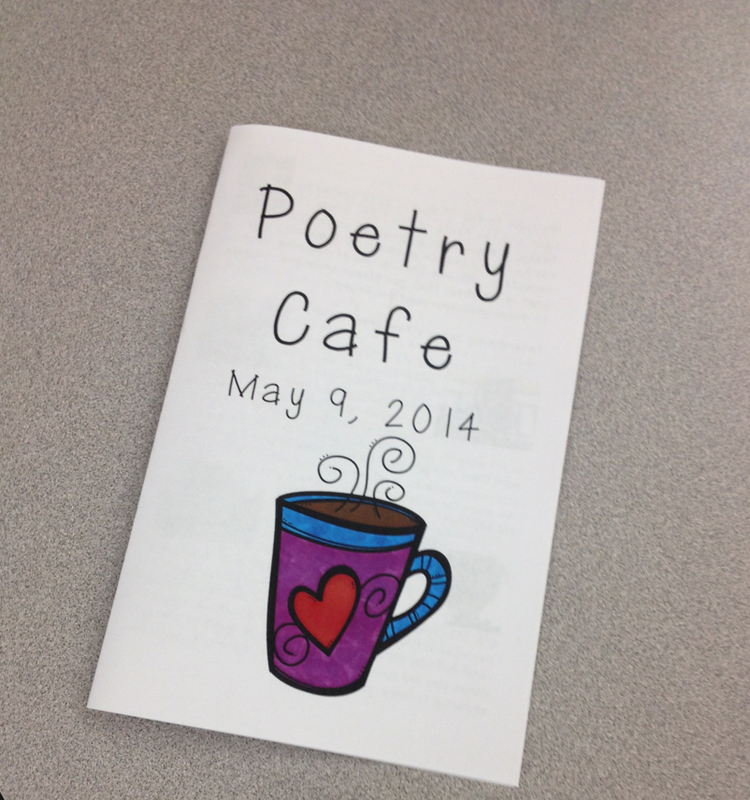 Have you ever done a Poetry Cafe? How did you do it?